If you’re planning a small wedding, why not plan one at a perfectly sized venue that offers world-class catering? If you’ve tried the food at Grapevine Cafe, you know how good it can be. If you haven’t tried the food, allow me to illustrate. If you can imagine food that excites the palate, but with up tempo tastes of the Mediterranean and Italian inspired cuisine with a kick. Grapevine Cafe doesn’t make anything that you might have had at other restaurants. Grapevine Cafe improves on all of those tastes, and surprises you with unbeatable flavor and exciting dishes that excite, and will always surpass expectations. If that sounds good, consider having your wedding here. The photos to the right were taken from an actual wedding that was held at the Grapevine Cafe. The ceremony and the reception were both held here. 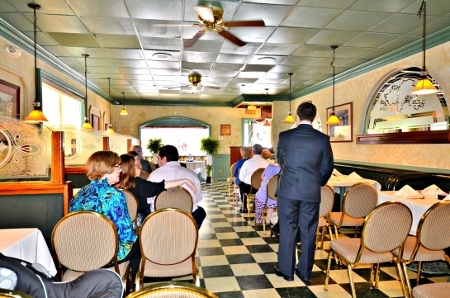 The wedding pictured included 30 people, but Grapevine Cafe can accommodate up to 75 people comfortably. 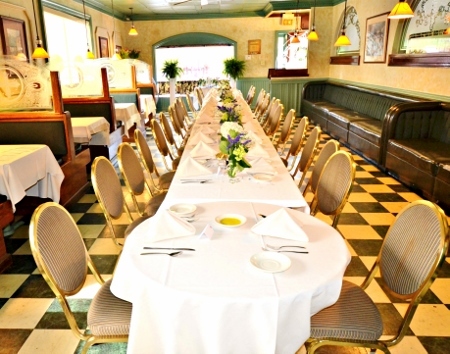 When the guests arrived, the restaurant was configured for the ceremony (pictured). After the brief ceremony, the guests adjourned to the bar area where a cocktail hour followed, while the ceremony area was configured for the dinner. After dinner, guests enjoyed themselves for a few hours, and then left. By all accounts the wedding was a great success and yours can be too.